Welcome to Domestic Mommyhood! Please stop by and give us a follow on pinterest! Moms sometimes have it rough in the fact that we’re trying to do so many things at once. We’re working, taking care of kids, working on the house, and sometimes we forget that to take care of ourselves. Don’t forget that spending a few hours in the morning with God can really help the rest of your day go a lot smoother. Here are ten scriptures to keep in mind as you go along your very busy day as a mom. Aren’t these scriptures wonderful? Print them off or write them out and put them around your house. It’s wonderful to know what you can open up a cabinet door and see God’s word right there. Sometimes it’s easy to get down and upset about the activities happening in our everyday lives, but you’re battling Satan by repeating these verses to yourself over and over again. 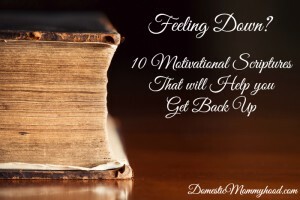 Don’t forget to stop by and check out these great motivation scriptures to help you feel better when your feeling down! 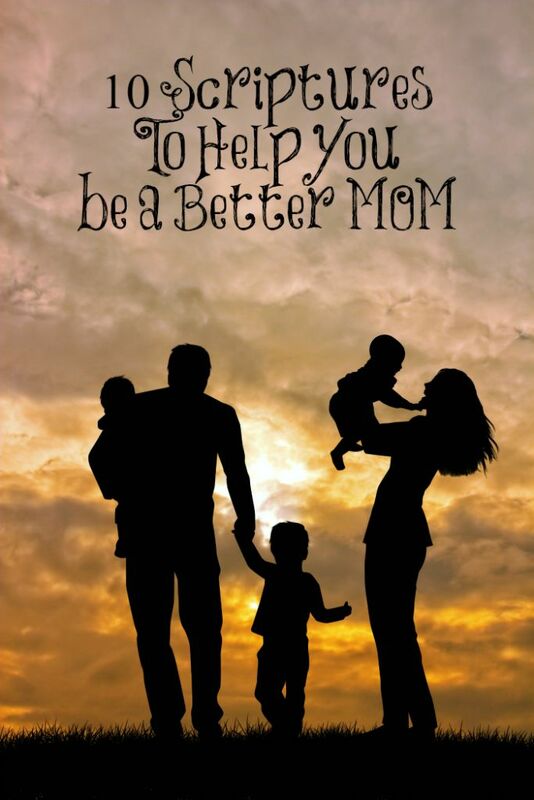 Do you have any Scriptures to Help you Be a Better MOM that help you get through everyday life?? Please share them in the comments below! I would love to read them too! Wonderful scriptures. Thank you for them A couple of mine, o give thanks unto the Lord, for He is good. Love one another as I have loved you. Be not overcome of evil, but overcome evil with good. Those are great Jojo! Thank you so much for sharing them with us! These are great! I put them on a scheduled share on my FB page for the 10th. That sounds great Marjie! Thank you for sharing! Thank you Stella! I hope to have more scripture posts in the future! My bible verse for the year is Hebrews 13:20-21. It’s great to personalize it with your name – I will provide every good thing you need, ________________________, to do my will! Try it. I’m so in love with this post. This is a greta daily reminder. Thank you!! Your very welcome Missi!So glad you enjoyed them. Thank you for taking the time to put these verses together and post them. Almost all of them spoke to me about something happening in my life right now!